PMC CEO Haruna Yukawa in a photo from Syria dated two years ago. The latest video posted this morning by ISIS militants shows members of the extremist organization threatening the lives of two Japanese hostages, Private Military Company CEO Haruna Yukawa (above) and freelance journalist Kenji Goto; both Japanese citizens were captured by the extremist group last year. The macabre setting of this morning’s video is heartbreakingly familiar: the orange jumpsuit-clad hostages knelt in front of a rocky dune next to the same hooded spokesman who has been featured in earlier beheading videos. In this morning’s video, ISIS demands that the Japanese government pay the group $200 million dollars for Goto and Yukawa’s safe return. This was apparently in reference to the recent decision by Japanese prime minister Shinzo Abe to commit $200 million in non-military aid to countries fighting ISIS; that decision was announced Saturday and was intended to support infrastructure projects. Abe also announced Saturday that his government is ready to commit an additional $2.5 billion humanitarian support. These monies are in addition to the country’s $2.2 billion dollar pledge two years ago to support humanitarian causes in the Middle East. Haruna Yukawa is believed to have been captured last year in Syria, while attempting to set up his private security firm Private Military Company (PMC), which he hoped would provide security for Japanese businessmen visiting areas of high conflict. Friends and family said that PMC was a new business venture for Yukawa, who had endured a decade of financial and personal difficulty following the death of his wife from lung cancer. 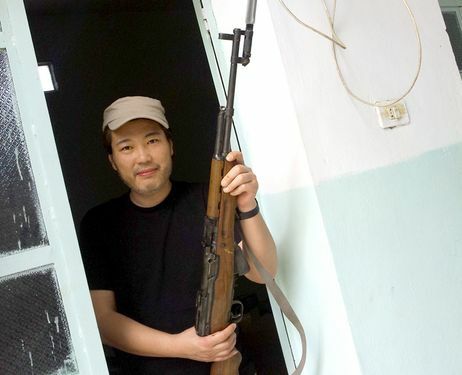 Videos on PMC’s website showed Yukawa in Aleppo, Syria, firing an AK-47. He was captured last summer, and a video released by ISIS purported to show Yukawa lying on the ground after having been beaten. This morning’s video is unusual for several reasons: not only is it the first time that ISIS has threatened hostages from an Asian nation, but it is the first time that the group has demanded a specific ransom sum. Previous videos from ISIS have threatened the lives of British and American hostages, as well as those from other European countries. While hostages from other European nations have been freed in exchange for substantial sums of money, both America and the UK have refused to negotiate with the terrorist organization, resulting in the gruesome and often videotaped beheading deaths of several hostages. Speaking at his daily news conference, Mr. Suga, declined to answer questions about whether Japan would pay the demanded ransom. This morning’s ISIS video sets a deadline for a response from the Japanese government on the ransom demand for 72 hours from this morning’s video release. The latest threats threats fit a larger pattern of horrific violence committed by ISIS against foreign citizens, as well as against citizens living within the boundaries of ISIS controlled territory. Since 2012, more than 23 people have been kidnapped — and at least 6 killed — by the group including the high-profile beheadings of American citizen James Foley and John Cantlie; most of the hostages were journalists and aid workers. Last November, the United Nations released a report on ISIS’ violence against Syrian people, which included over 300 first-hand accounts from refugees fleeing the area. Those refugees describe the near-total removal of internationally protected human rights and freedoms, and violent (often fatal) retributions in public exhibitions that include shootings, stonings, beheadings, whippings, amputations and crucifixions. These attacks may be in response to such “infractions” as smoking, minor theft, “improper” dress, practice of a non-Islamic religion, and accusations of homosexuality. Women living in ISIS-controlled territory are also forced into total restriction of their daily activities, and girls as young as 13 are frequently married against their will to ISIS members. Finally, the UN also reported that in the middle of last year, ISIS conducted a widespread forcible displacement of Syrian Kurds, and Kurdish refugees fear that these efforts may soon escalate into a full-scale ethnic cleansing. The United Nations today issued a new press statement detailing these human rights violations by ISIS against Iraqi and Syrian civilians, and urged the international community to remember the broad scope of ISIS’ violence against all people within its reach and control. Stay tuned to this post for additional updates as they come in. In the meanwhile, my thoughts are with the friends, families and countrymen of Haruna Yukawa and Kenji Goto — including many who call themselves Asian Americans — as well as with all the civilians of Syria, Iraq and other parts of the Middle East currently being victimized under ISIS rule. Many mainstream outlets are sharing links and screen captures from today’s hostage video released by ISIS. I have elected not to do so. The purpose of these videos are to exploit our voyeurism to raise the profile of ISIS extremist militants using gruesome videos, and to maximize the terrorist impact of ISIS’ tactics by instilling fear; I choose not to facilitate that goal or to dehumanize the hostages by spreading these images of violence and brutality.